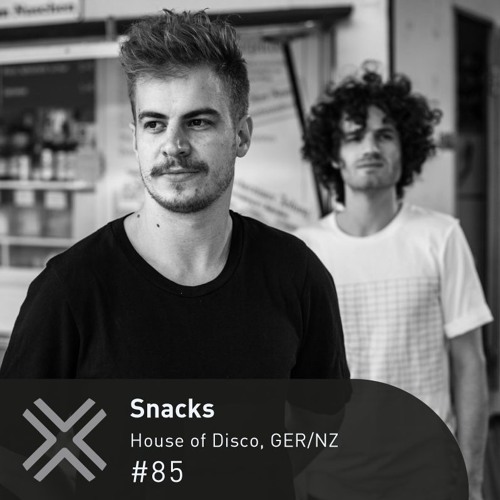 This week's instalment is courtesy of Snacks! Aljoscha and Rene have strayed from the well-trodden path of peak time Italo, digging a bit deeper to deliver a brilliant hour of some lesser-known records. This is also excellent Friday fodder! Below are some words from the lovely duo: Talk to us about some upcoming projects (don't be afraid to spill the beans!) R: Constantly improving our live set, we also would love to play in a band kind of setup. We started having some writing sessions with a couple of good friends, multi instrument freaks and this has been really eye opening for me and Aljoscha. At the moment we are trying it out in the hope we can develop the live setup into a electronic band. A: There are a few remixes coming one for Johannes Albert and another one for a band from Hamburg called Pool. Then we both have also side projects. Rene produces some other music for example the new EP of Yates, give it a listen, it’s fantastic! Favourite track on the mix, where did you discover it? A: From the old songs I would say D Train ‎– You're The One For Me - This one I discovered on discogs, during my weekly discogs music listening nights. And a really special one Africa - A.I.E. (A Mwana) we got some secret tips from our friend Lovebug and we really love it! R: From the kind of newer production I would say its the Johannes Albert - Giovanni Frizzante, we played it over the summer and it works every time. For me one of Johannes Albert's best tunes. Who is the faster runner in the duo (I recon Rene is actually v fast) A: We never worked as runner in clubs, usually we DJ, but I would say Rene is faster on his feet, R: Running I'd like to think I'm quicker, but Aljoscha is actually pretty quick when he wants to be. If we are both carrying record bags I think he'd be faster. Bigger guns! The mix is full of some really tasteful italo (and whilst we all love the feel-good/peak time feeling that italo is known for, you guys have managed to search a little deeper and uncover some more unknown italo tracks - nice work! But what helps you overcome the sometimes stressful/painful process of recording podcasts? R: For this one we wanted to go deep, so we spent a lot of time on Discogs, OYE records and Hardwax. We consulted with a few anonymous expert diggers from down south. They set us on the Italo path. A: Sometimes we were also checking Instagram so that we were able to see whats happening outside of our studio basement. Any recent embarrassing tour moments that we can joke about? A: There are too many, really embarrassing ones, which better stay on tour R: My favorite one is from a show in Frankfurt. I won't go into details, but it was more the open mouthed astonishment of a passenger on the train ride back to Berlin overhearing us recount the tales of the night. It was then we both realized how crazy this night was. Which ended with us deciding we can't tell anyone about this night. If you ask us in person. We might tell you about it.